Having just read about the 30% decline of wildlife on this planet since 1970 it seems unfathomable that we can allow it to continue. But we do. (That figure of 30% can be a little misleading since in tropical areas it rises to a 60% loss which is horrendous). 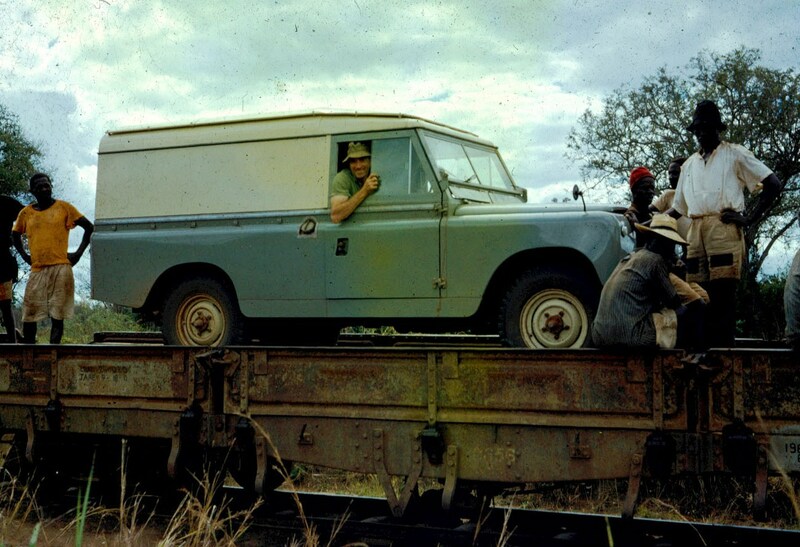 When my dad first moved to East Africa in 1952 he, like many other white people over there, became one of Africa’s hunters. It didn’t take him long to realize what was happening to the wildlife and he soon turned to the camera to document rather than hunt and became a passionate advocate of wildlife. This was in the late 50s and early 60s so if everyone else followed suit, we’d have already worked out what we needed to know by 1970. It obviously didn’t happen though because we are decimating wildlife at unprecedented rates despite a slew of conservation societies around the world trying to educate us not to. So what is happening, how are mucking things up and why aren’t we fixing things? Of course, the problems run much deeper than saying “take care of the environment and the animals in it”. Just off the top of my head we have land loss and degradation, pollution, bush meat trade, souvenier collecting, removal of major predators which causes grazers to flourish and destroy the land through overeating, illegal fishing and hunting, legal fishing and hunting (which can be managed well but in some countries are NOT). Add to this our consumer society where we absolutely must have the latest whizz bang thing just to keep up with the Joneses or to feel like our life has meaning, and of course the built in obsolescence which most modern electronic and mechanical devices have. Let’s face it, our repairmen have become fitters because it’s cheaper and easier to fit a new one and throw the broken one away rather than repair it. You only have to look on the side of the suburban and country roads to see the discarded TVs and computer monitors to illustrate this point. 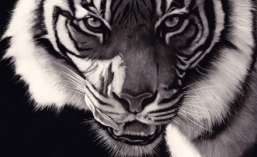 I’m one of those who likes to keep things upbeat but when I read that awesome wildlife artist Eric Wilson‘s 2007 blog post about the imminent demise of the tiger, it really hit home. There are massive efforts underway to prevent this animal going the way of the dodo and many other extinct species and yet even he, a man who cares deeply for this animal and is part of those efforts, has just about given up hope. However, just because we feel like we can’t do much doesn’t mean we shouldn’t. We are the example for the next generation. We are the people who can bring about change but in order to do that we need to become engaged. There is no room for complacency in the fight to keep our wild heritage. We need it more than it needs us. Maybe my generation will scrape by but subsequent ones won’t. And I don’t want to just scrape by while magnificent species vanish. Some people say “Imagine being the generation that had to explain to their kids why the tiger is no longer with us” but I’d rather say “Imagine being the generation that saved the tiger”!! 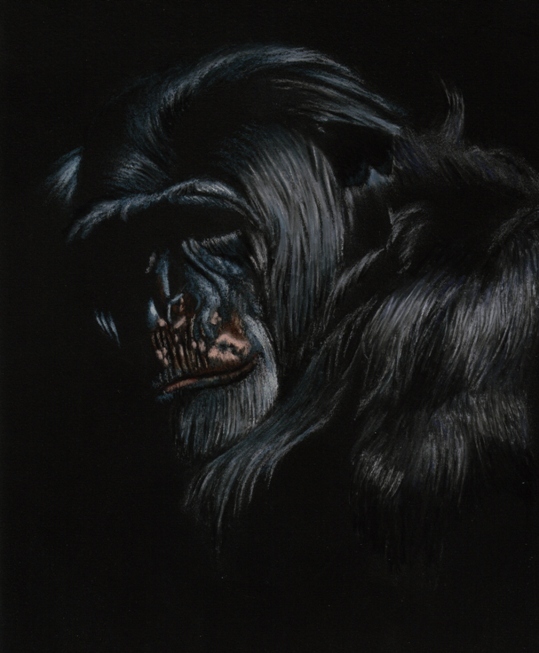 Let’s not end up with the chimps “turning back in anger” as in my pastel sketch below. ← A couple of doggy stories, the grateful mutt and the fierce softy.